Fig. 1. 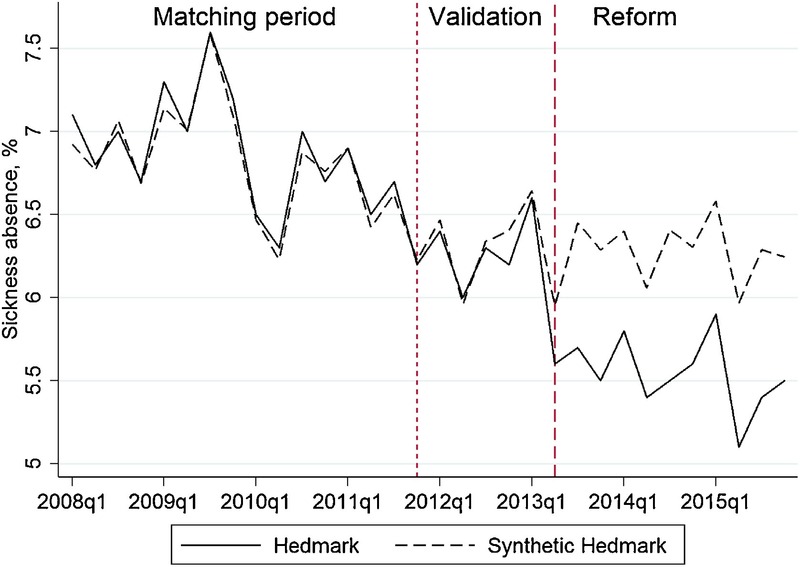 Trends in the sickness absence rate in Hedmark and the synthetic control region. Published 2018-10-10 at 1676 × 1187 in Activation against absenteeism – Evidence from a sickness insurance reform in Norway, published in Journal of Health Economics Volume 62, November 2018, Pages 60-68. Note: The dotted line at the fourth quarter of 2011 indicates the final quarter of the matching period. The dashed line at the second quarter of 2013 indicates the period in which the activation program was introduced.